A bomb tore through a shopping centre in Lebanon's anti-Syrian Christian heartland north of Beirut killing three people, including two foreign workers. It was the second blast in a Christian area in days, sharpening fears of sectarian chaos weeks before elections. The explosion at the Kaslik shopping centre occurred at about 0130 local time (2330 GMT), police said. Shop windows were shattered and glass littered streets lined with boutiques, jewellery stores and nightclubs. Lebanon has been plunged into political turmoil since the assassination of ex-Prime Minister Rafik Hariri on 14 February. President Emile Lahoud has ordered an investigation into the attack in Kaslik, near the port of Jounieh, about 15km (10 miles) north of Beirut. He said it aimed to drive Lebanon into "chaos and fear" and he renewed calls for talks between opposition and loyalist politicians "as the only means to break the current deadlock and bridge all differences". The bomb is thought to have been left in a leather bag at the back entrance of the shopping centre, a Lebanese security official said. Two of the three fatalities were Indians, with the nationality of the third still to be determined, police said. 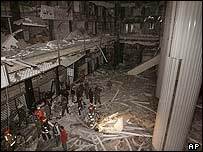 The roof of the centre - which was closed at the time of the blast - collapsed, and local television showed rescuers searching through the rubble. One body was shown retrieved and covered with a blanket. One Lebanese person was also reported to have been injured in the blast. "It is clear that those who carried out this attack are targeting the security and stability of the country," opposition lawmaker Faris Bouez told reporters at the scene. "It is a political message to the [anti-Syrian] independence uprising," he said. "We don't know what is happening, but it's obvious that we are very frightened," said local resident Claude Boustani. The opposition has blamed Damascus supporters for recent violence, saying they are keen to stir unrest to justify the presence of Syrian troops in Lebanon. At about midnight on Friday, another blast took place in the northern suburb of New Jdeideh, a part-residential, part-commercial area, injuring 11 people. Following the pressure on Damascus after Mr Hariri's assassination, some Syrian troops are now withdrawing from the country. Demonstrations and counter-demonstrations, although largely peaceful, have kept tension high between Lebanon's pro-and anti-Syrian camps.